The 11th Hebei Provincial People’s Congress closed its fourth session on Sunday in Shijiazhuang, the capital city of North China’s Hebei Province. The fourth session of the 11th Hebei Provincial People’s Congress ended on Jan 16 in Shijiazhuang, the capital city of North China’s Hebei Province. 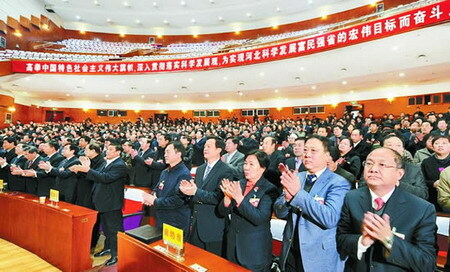 Hebei Party Secretary Zhang Yunchuan, who chaired the meeting, announced the election results. Xie Jilai was elected deputy director of the standing committee of Hebei People’s Congress, and Shen Xiaoping was named deputy governor of Hebei People’s government. Deputies in attendance approved the province’s 12th Five-Year-Plan (2010-15), the implementation report of economic and social plans for 2010, economic and social plans for 2011 and other government resolutions. Zhang concluded the meeting with a speech.